Google have released a new tool named "SearchWiki" to allow signed in users to organise and amend the natural search rankings based upon their own preferences. Google users will also be able to share their website rankings with other SearchWiki users. See the video below from on of Google's lead boffin, Amay. Google are claiming this initially will not effect the way natural search appears for users which are not logged in - but I trust that will not stop SEO agencies and consultants from negatively scoring their clients competitors and for that matter merchants and affiliates with their sites. 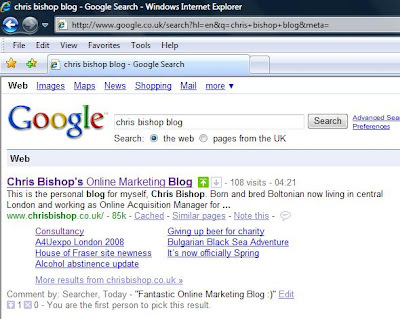 This really will mean soon that no search result is the same to different users and will surely be a nightmare for SEO agencies to benchmark the search engine rankings - when their clients top customers therefore have the ability to customise and personalise their search results how they would like to have them ranked and alter these day by day.